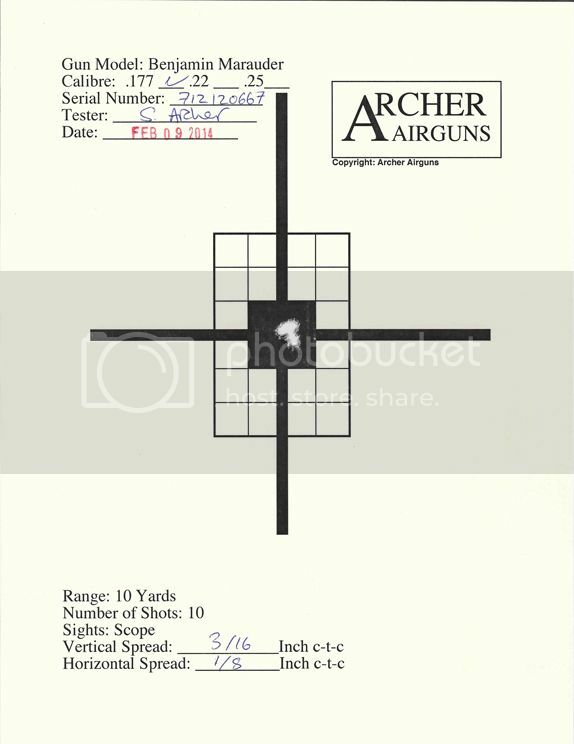 Archer Airguns Marauder PCP Gold Service Test is the most comprehensive service available to help you understand your new Benjamin Marauder air rifle’s performance and shoot it more accurately. This unprecedented amount of data is a real gold mine of information for hunters and field target shooters. It also forms a basis for tuning a new Marauder according to the guidance published by Crosman in the Marauder Owner’s Manual. It’s available for all new or refurbished Marauders sold by Archer Airguns and is selected as an option in the store. 1. Muzzle velocity (FPS) and muzzle energy (Ft/Lb) individually recorded for 50 shots using Crosman Premier HP pellets. 2. Identification of maximum FPS and at which shot. 3. Confirmation of gauge pressure for maximum FPS. 4. Shot count for three Extreme Spreads: 10 FPS, 20 FPS and 30 FPS. 5. Indication of built-in pressure gauge accuracy by comparison to high accuracy standard test gauge. 6. Data and graphic comparison of FPS and pressure gauge readings. 7. 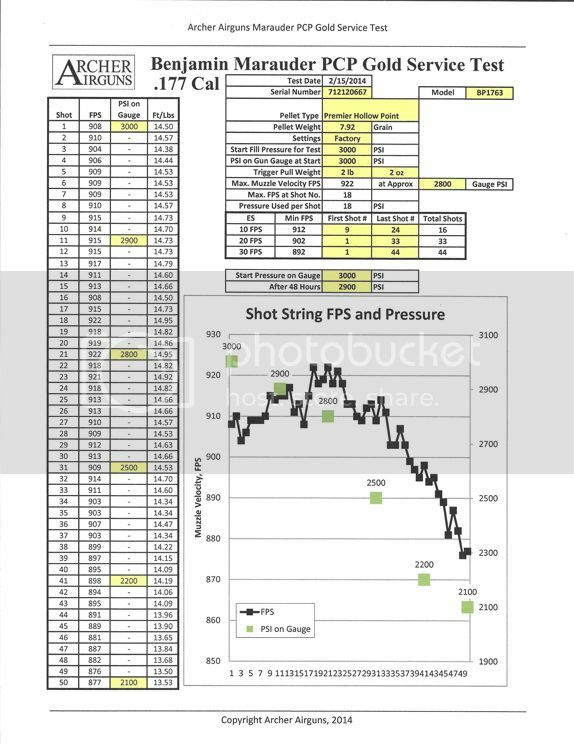 Average pressure used per shot. 8. 48-hour pressure retention test. 9. Trigger pull weight reading. 10. In addition, a 10-shot 10 yard test target is also provided. A sample test report and test target are shown below. Archer Airguns’ standardized testing environment assures the repeatability and consistency of data provided. There’s also notes to help with interpreting the information, explanation of abbreviations etc.